One of my favorite local landmarks is Bennett's Mill Covered Bridge, which crosses Tygarts Creek near the town of South Shore in northeast Kentucky. 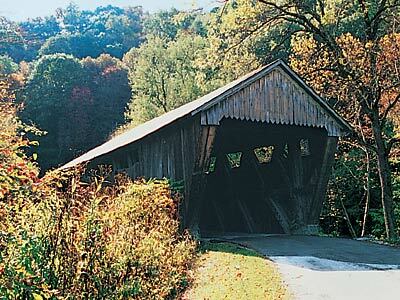 Built in 1854, the 158-foot-long beauty is the only example of what's known as a Wheeler truss bridge in the United States, and one of 13 covered bridges still standing in Kentucky. The bridge was named after B.F. Bennett, who established a mill that once stood nearby. During the Civil War, Union soldiers considered the bridge so important that they protected it with guns on the surrounding 800-foot bluffs. The bridge is in Greenup County, about 35 miles north of I-64. To get there, take Exit 185 off I-64 and head north on U.S. Highway 60. When you reach Ashland, a 10-mile drive, take U.S. Highway 23 northwest along the Ohio River. In 21 miles, you'll reach State Highway 10; head west for 5 miles until you reach State Highway 7. Then drive north for .8 of a mile; the bridge is on the east side of the road. For more information, call the Greenup County Tourism Convention Commission at 1-606-833-9098.